Organizing people ought to be easy. Tell your team members where to go, when to show up, when to leave, what to bring, and what to do. That approach usually works for work-related activities. But if you are corralling people for non-work-related functions, like field day at your child’s school, snacks for sports practices, book club meetings, fundraisers, scout outings, dinners, and so on, organization can be daunting. Having been on both sides of the organizing fence (that is, having coordinated people for special events as well as having participated and volunteered with various groups), I know it’s not easy to clearly communicate with a range of people, all with varying expectations, attention spans, and background knowledge. Plus, the sites have capabilities to send email reminders to those who have volunteered to prepare meals. The meal coordinator (typically someone other than the person who needs help) sets up the schedule and invites people to participate. If you want to help, you can see what days are available and what other people are bringing to avoid serving the same thing (like chicken casserole for five consecutive days). And you don’t have to bother the person who is trying to recover from surgery, giving birth, illness, etc. with questions about when to visit or where to bring the meal. If you want to share detailed information so that you can coordinate activities with another person or a group of people, online tools are handy. Google Docs (or the upgraded Google Drive), SlideShare, and similar tools enable you to create, update, and publish documents, spreadsheets, and presentations, and then reference these files when communicating with other people. Being able to access up-to-date information makes it easy for me to stay organized and coordinate with other people. For example, earlier this year I created a spreadsheet with details about scout families (names, positions, completed training, dues paid, etc.) and shared it with troop leaders so that we could develop a plan of action to alert people to requirements and deadlines. These tools are flexible, and you can use them for nearly any type of project that could benefit from sharing of detailed information. I love that only the most recently revised file is available, which helps to avoid confusion because everyone is looking at the same version. Plus, people who routinely delete emails can access the files easily. Typically, there is flexibility in how you design and present options for, say, the day you’ll have the group outing or the number of desserts you need for the potluck. You can give a few options or offer one choice, and you can ask for an RSVP indicating how many people will be attending with you. I like using online tools that provide visibility of what everyone is saying and how they are responding, rather than having to speculate about the content of private conversations among group members. That way, it’s not up to the leader of an informal group to manage harmony; members can regulate interactions among themselves. Among the online tools that I want to use (but haven’t yet started using) are those that allow you to organize people for large events, recurring activities, and projects with lots of details. Generally, there are options to send email reminders to volunteers a few days before the event, which saves time for the organizer. As a volunteer, I am hesitant to sign up for assignments that may be vague in terms of duties and time commitments. Plus, I may not have time to respond when requests are made and sometimes feel uncomfortable asking for details a couple of weeks later even if the need might still be pending. With an automated signup system, I can check at my leisure to see what items are still needed or tasks still need to be done. In such situations, naturally, group leaders and volunteer coordinators often think that their would-be followers are resistant to being organized. And, while it’s true that other people sometimes make no effort to consider and respond to opportunities, very often they just don’t have the creative energy to read, interpret, and act on requests, especially those that seem unappealing or unclear. The easier it is to understand what is being requested, the more likely someone will respond in the way that is useful. 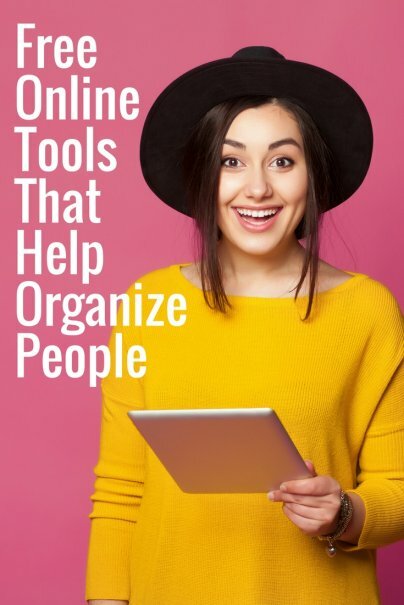 What are your favorite online tools for organizing people? Thanks for sharing these tools. I like organizing - things, events, etc.